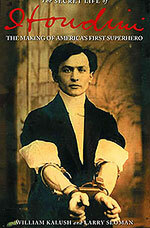 The great magician, escapist and mysteriarch, Harry Houdini (1874-1926), lived such a storied life that it is impossible to capture any semblance of it in the fleeting medium of the feature film. The best we can hope for is Tony Curtis flashing a winning smile or for Johnny Depp to flash a winning bangle, and to then get the hell outa there, before anyone realizes you haven’t even grazed the surface. Speaking of Glaser the surface – Paul Michael Glaser is… THE GREAT HOUDINI. Spit-take. He can’t even escape his David Starsky white-fro. How will he do against a water torture cell? TV director Melville Shavelson (YOURS MINE AND OURS, 1968) and writer Peter Benchley (JAWS, 1976) try to capture the wild spirit, the profligate, arrogant genius of the King of Handcuffs. And fail. As Houdini’s wife Bess, Sally Struthers tries hard not to sound like a shriking fishwife dreamkiller. Fails. Lucille Ball’s annoying neighbor (Vivian Vance) is an old nurse with the glib wit of a herpes sore, who also narrates – this woman with the voice of a cheese grater on testicle flesh… is narrating! Bill Bixby is clairvoyant Father Ford, who tries not to turn into THE INCREDIBLE HULK. Succeeds! THE GREAT HOUDINI quickly gets bogged down in the love triangle between Houdini, Bess, and Houdini’s Mama Weiss (Ruth Gordon). Lots of hay is made pitting Catholic Bess against Jewish Mama Weiss. Bess complains that Houdini and his Ma should get a room, and Mama complains Bess is a shiksa. With The Great Glase-dini eventually turning to Adrienne Barbeau’s massive cleavage for warmth and understanding. The tricks are all here – the needles, the water torture, the milk can, the straitjacket, the metamorphosis, but presented with such a dearth of directorial skill they lack any punch. Speaking of punches, movie goes with the angle “Houdini-was-punched-when-he-wasn’t-ready-so-he-died.” The Tony Curtis version (HOUDINI, 1953) was not much better on this point, as they went with “He-turns-and-gets-a-sword-in-his-gut-so-he-dies.” Why don’t they just foreshadow Houdini had appendicitis and that anything done to his torso would exacerbate it? Because that’s not cinematic. Oh, you know what’s not cinematic? This movie. Peter Cushing, who played SHERLOCK HOLMES in the 1968 TV series, plays Holmes’s creator here, Sir Arthur Conan Doyle, who is represented as a fanatic spiritualist (the likes of which Harry disdained), because he was. Doyle would hound Houdini like a Baskerville all his life about his wife’s ability to contact the other side, making Houdini sit for a séance where Mama Weiss supposedly speaks from the spirit world; Houdini correctly points out that if Mama spoke to him from the other side, she’d be speaking Yiddish, not English. And that a real miracle would be getting Huggy Bear to stop doing meth. When Father Ford gets in on the contacting-the-dead act, not turning into the Hulk looks a bit dicey, but he pulls through – for himself and the spirit world and Arthur Conan Doyle – as he contacts Houdini after Houdini’s death and everyone is happy and gay because spirits exist. Hooray! Bess never did contact Houdini after his death – I mean, how could she? He was dead! – but that makes no difference to a biographical movie, does it? Writers: Peter Benchley, Melville Shavelson. Starring: Paul Michael Glaser, Sally Struthers, Ruth Gordon, Vivian Vance, Adrienne Barbeau, Bill Bixby,, Jack Carter, Peter Cushing, Nina Foch, Wilfrid Hyde-White, Geoffrey Lewis, Maureen O’Sullivan, Clive Revill.